Inspired by the confederation of merchant guilds that dominated trade in the Baltic and North Seas for 300 years. This beer is the coalescence of a cognac barrel-aged Baltic porter, a brandy barrel-aged imperial stout, coconut, cinnamon and vanilla beans. Another El Cat beer! Into an El Cat glass! And we don’t even have a cat! Why am I so excited! Isn’t it self-evident! It’s an EL CAT beer! 750 bottle split with my wife! Black, black, black. The nose is almost entirely booze & brandy. Not much depth, but it’s not something I’m repulsed by. Konigsberg is hot. Cognac & brandy are a quarter-inch from my nose, & I can’t see anything. Nor would I for 17 hours if I drank a few glasses of this. Tastes more like a woody cordial than beer. Vanilla emerges as it warms; no cinnamon, which I can’t say hurts my feeling. Plenty of alcohol, toffee, with only the ghost of coconut & smoke breezing in on the finish. Treacly. Filling. Half a bomber will do this Cat just fine. Too one dimensional to be great, this is a showcase for the barrels that drowns out nearly everything else. Still very nice. The brew appears black in color with a thin khaki head that fades leaving spotty lace. It smells of cinnamon, roast and anise. The taste is of black licorice, cinnamon and raisin. This is medium in body with modest carbonation. Overall decent but not worth the price all things considered. 750ml bottle with bottling date of 02/23/18 etched on the neck of the bottle. This is a nice blend of cognac barrel-aged baltic porter, a brandy barrel-aged imperial stout, coconut, cinnamon, and vanilla beans. Poured into a Cigar City El Catador snifter. The coconut is the most prominent note on the nose with the cinnamon and vanilla taking a back seat lingering in the background. The cognac and brandy barrel notes are definitely present in the nose and taste as well. The mouthfeel is a bit thinner than expected. This finish is pretty hot from the alcohol (granted this bottle is a few weeks old). I do think this one will be better overall with age. 750mL bottle acquired through the El Catador Club. Bottled 2/23/18. Served in a Cigar City teku. Enjoyed 8/9/18. Pours midnight black with two fingers of dense khaki head. The froth settles to a thin veneer and sturdy perimeter. Rich sweet aromas immediately greet my nose. Cinnamon, brandy, vanilla, caramel, coconut, hot cocoa and wet wood. It’s a delightful blend with significantly more nuance than I’ve described. A decadent,warming barrage of flavor. Fudge, cinnamon, cognac-drenched wood, toasted coconut, cooked caramel, apple skin, faint vanilla, slight char and a little booze. Absolutely delicious. Full, thick feel with pleasantly restrained carbonation. Cognac brandy glazed, cinnamon dusted brownies. More outstanding barrel work for Cigar City’s El Catador Club. 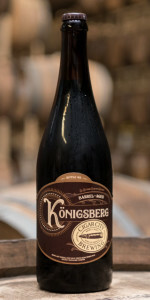 Barrel Aged Königsberg is a delicious blend of styles, barrels and additives.